The homes are drawn from Bellway’s contemporary stable of designs which feature more modern elevations benefitting the homes with larger window areas adding to the modern appeal of the properties. “We have found that buyers really appreciate the curb appeal of these homes and once inside the amount of increased light is quite noticeable giving them a very airy ambience. 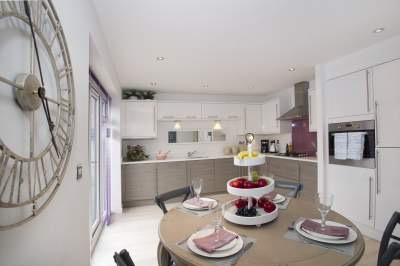 All the homes include fitted modern kitchens some with integrated appliances, open plan living spaces, garages or allocated parking and turf to the front garden. Buyers can also select from our extensive range of additions to create a bespoke feel for their new home, which we will fit ready for the move in day,” said Bellway’s Sales Director, Rob Armstrong. Buyers can also take advantage of the Help to Buy scheme which only requires a five percent deposit and provides a twenty percent five year interest free Government loan which helps reduce mortgage repayments during the first five years of ownership. For families, Holystone Park is close to a number of excellent local schools including Holystone Primary School for young children and Longbenton Community College for secondary age pupils. Post-16 education is offered by Tyne Metropolitan College, three miles away, while the nearest universities are situated in Newcastle city centre, around six miles away. The area is well served with a number of local amenities including a large supermarket at Benton, just a few minutes drive from the development. Silverlink Retail Park at Wallsend is around five minutes away by car and is home to well-known chain stores, as well as an Odeon cinema. Leisure opportunities near Holystone Park are plentiful. The beaches of Whitley Bay, Tynemouth and Cullercoats can all be reached in around 10 minutes by car. Closer to home, the Rising Sun Country Park comprises 400 acres of grassland, woodland, wetland and a lake, which is designated as a local nature reserve. For sports enthusiasts, the Lakeside Centre at Killingworth has a swimming pool, gym and sports hall, while there are several golf clubs nearby..
For commuters, Holystone Park is ideally positioned close to a number of Major routes including the A19, for travel to Sunderland, Durham, Middlesbrough, York and Doncaster, and the A1058 Coast Road for Newcastle and Tynemouth. Both Palmersville and Northumberland Park Metro stations are around 10 minutes walk away.